IBM DB2 Recovery Expert manages the recovery of DB2 for z/OS V8 and V9 objects in a data sharing and non-data sharing environment. The major focus of IBM DB2 Recovery Expert V2.1 for z/OS (5697-N92) is on DB2 system level backup and restore. The tool provides the ability to create a consistent full system backup with no impact on DB2 availability, comprehensive backup and recovery reporting capabilities, and robust database and storage validity checking to ensure successful creation and usage of database system backups. By integrating with disk storage functions, it supports DB2 subsystem recovery from system backup, DB2 subsystem disaster recovery, and DB2 object data recovery from system backups. It also helps in selecting the most convenient recovery solution and in managing backups. This IBM Redbooks publication documents how to use Recovery Expert V2.1 for all restore and recovery functions related to system level backup. 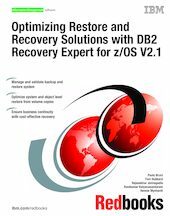 For scenarios of using Recovery Expert functions when recovering DB2 objects from traditional image copies, see the previous companion IBM Redbooks publication IBM DB2 Recovery Expert for z/OS User Scenarios, SG24-7226.